Let's step it up a notch and give those little birdies something to brag about. 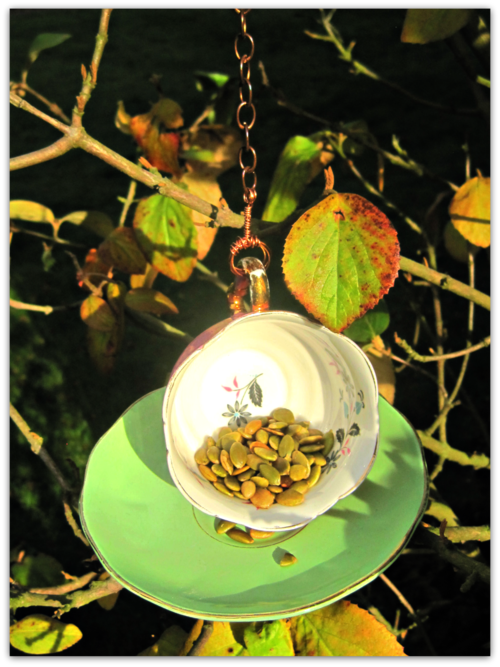 This china bird feeder was super fun to make. I think it was because I got to go shop for china tea sets, something I've never felt the need to do in my daily life! I use E6000 glue because it's the strongest glue I can find that is also water-proof. This is an important feature as the feeder will be outside. The first thing you want to do is make sure your cup and saucer are nice and clean. I got mine at Value Village for $7.00 and they are green and pink so I think that was worth it! Place the handle of the tea cup straight up and down and position it so that you maximize the surface contact between the cup and saucer. This will give as much surface area as possible for the glue to bond the two surfaces together. 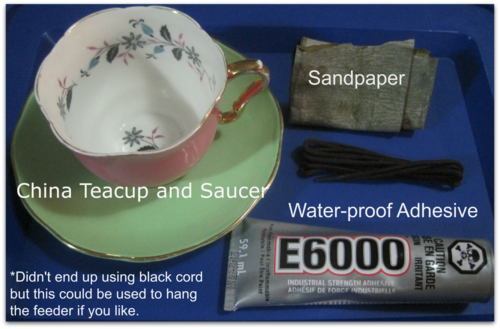 Take your sandpaper and sand the areas of the cup and saucer that will be touching. This opens up the 'pores' of the china so the glue can bond better. Use a rough sandpaper (I used 40 grit, but as fine as 80 will do the job). 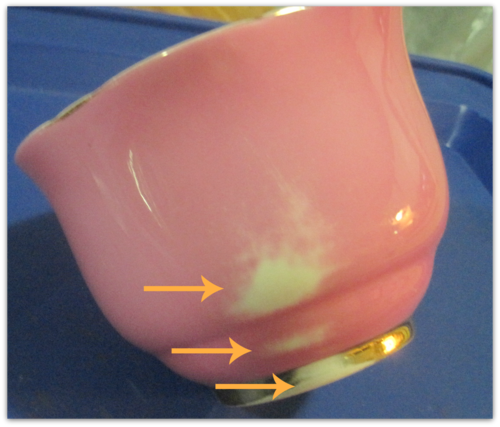 Sand both surfaces until you have taken off the outer layer and you begin to see the white china underneath. In a well ventilated room or outside, apply the glue to both surfaces and hold for a minute or two to make sure it sets. This step is important because the cup will lean a little and loose its position (note that my cup is a little crooked...oops!). Let the glue dry for 24-48 hours. First you want to wrap your wire around the handle of the cup at least three times. I use a 20 gauge wire for the wrap because it's still easy to manipulate but should be strong enough. From there I wrapped the top part of the wire a few times to strengthen it then wrapped up the base of the wire about half an inch. 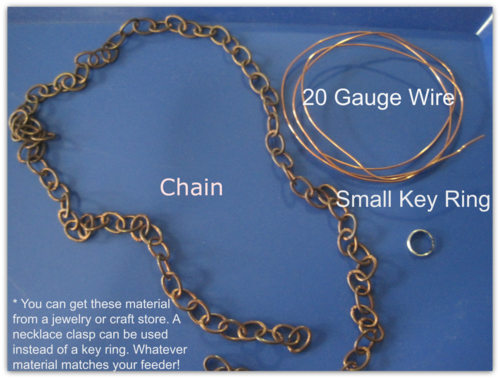 Loop your chain through the wire and make another loop to enclose the wire around your chain. Again I did three loops to make sure everything was strong enough. 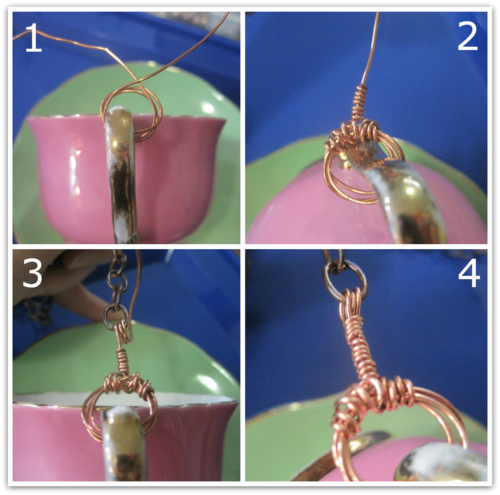 Once you have made your loops, wrap down the base of the wire until you meet the wrapped wire coming from the handle. Now, at the other end of your chain, wrap a key-ring around the last chain link then fasten it about 4 or 5 inches down the chain to make a loop that will fit over a branch. I chose to use a key-ring because it will allow me to adjust the size of my loop depending on the size of the branch I am hanging my feeder on. And voila! You have a fancy bird feeder! Excuse the seeds in the cup, I haven't got my hands on proper bird seed yet!